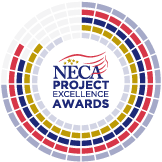 NECA will begin accepting entries for the 2018 Project Excellence Awards (PEA) program January 1, 2018. These awards recognize NECA member companies for their outstanding commitment, professionalism, and ingenuity in delivering an electrical project across 11 different market sectors. Contact Mir Mustafa at mmm@necanet.org or Ashley Cicero at ashley.cicero@necanet.org with any questions.